The Hugo nominees have been announced! First of all, nothing that I nominated made the finalists. (Although I nominated Game of Thrones in long-form dramatic presentation, and an episode made it through in short-form.) Oh, well. The category that I am most interested in, Best Novel, had a two-novel overlap with the Nebula nominees: 2312 and Throne of the Crescent Moon. and probably The Drowning Girl. The only problem with Glamour in Glass is that I have a rule not to read series out of sequence. This rule dates back to my childhood days reading The Hardy Boys novels, so it is completely ridiculous, but so ingrained that I find it impossible to break. The previous book in the series is Shades of Milk and Honey, a 2010 Nebula nominee. It was not one of the three nominees I managed to read that year, but I find that somewhat encouraging. Still, I am developing a long list of books to read in the first part of the year (see below). Assuming I get those four (well, five, with Shades) books read before the Hugo packet comes out, what next? Well, here's where my book series rule (I should develop a catchy name for it) comes into play. One of the Hugo nominees is Blackout, the third book in a zombie trilogy. I don't really like zombie books or movies, but I should give this one a shot, which adds the first two books in the series. Another nominee is Captain Vorpatril's Alliance, the latest entry in the Vorkosigan Saga. Let's look at how many entries there are...twenty-two? (Spit take.) Well, it's not as bad as all that. The list contains two short stories and four novellas. I don't feel compelled to track those down, and even if I did, they're shorter. So that's...fifteen prequels. But wait! I actually read Falling Free, the first novel (according to the saga's internal chronology) and a previous Nebula winner. It's not tightly related to the rest of the saga, so I could have probably justified skipping it, but now I don't have to. Fourteen! And one novel takes place after Captain Vorpatril's Alliance (the author suggests reading the novels in chronological order rather than publication order), so I'm down to thirteen. After all that, seven books doesn't seem so bad, does it? The remaining Hugo nominee is Redshirts, so that goes on the list, too. Anyway, Seraphina is a the story of a sixteen-year-old court musician who is a half-dragon. Dragons can take human form, which leads to much suspicion, but almost nobody believes that half-dragons are possible, so Seraphina has to hide her true nature. The book takes place in the aftermath of the murder of a prince and on the eve of the 40th-anniversary celebrations of a peace treaty between humans and dragons. It's a "young adult" book, but after much thought, I've decided that the idea of "young adult" as a classification is misguided. I understand that certain books like Have Space Suit—Will Travel are particularly attractive to a teenage reader, and that maybe you'll be able to relate better to Seraphina if you're a teenage girl (even more if you're half-dragon!). I don't think, however, that libraries or bookstores should have separate sections for "fantasy" and "young adult fantasy". I think separate sections for "this book has dragons in it" and "sorry, this book doesn't have any dragons" would make at least as much sense. I guess what I'm saying is go ahead and read this book if you're an adult, but you could recommend it to a teenager, too. If it matters, it's probably PG; then again, most teenagers would probably prefer the R-rated books. I've seen reviews which mention that the idea of dragons taking human form is what makes the book so wonderful. I don't think the idea is new here. I'm sure I saw it in D&D 30 years ago, which means it was borrowed from some other place. The author does a great job, however, at addressing the implications of what it means to be one species in the body of another. The dragons are one part of a very richly-drawn setting that is the books strength. The characters are also interesting. Seraphina's status as between two cultures will resonate with anyone who has struggled with feelings of not belonging -- which I believe will help the book's "young adult" plea. The plot is interesting, but not the reason this book deserves five stars. I only regret not reading this book before the Hugo nominations closed. I've been trying to put fun things on my "to do" list, along with chores. One theme that dominates this part of the list is that I want to make sure I actually enjoy my Christmas and birthday presents, rather than saying, "This looks fun," and then setting them aside with the feeling that I won't have time to use them. One such present was A Feast of Ice and Fire: The Official Game of Thrones Companion Cookbook. It's a collection of recipes that you might find in Westeros. As far as I can tell, the methodology is to find offhand reference to some dish in the books, then use medieval sources to create a recipe, along with a possible modern variation. The recipe I chose to make was the modern version of a cheese and onion pie (served at a wedding in King's Landing in the third book, and I suspect the fourth season of the TV show). The dough, though, was a medieval-style recipe. I think the saffron and egg yolks gave it an interesting flavor. The filling turned out really well. I think the main change I might make would be to cut back on the amount of potato and onion -- they provide the bulk of dish, and I had to use a bigger pan than expected due to the amount of filling. Christina thought I should cut back on the cayenne pepper and consider including some meat. The crust suffered a little bit in presentation due to my inexperience -- it has been more than 15 years since my one previous attempt to bake a pie crust. It was still tasty, but I can probably learn a few things before my next attempt. There's a recipe for fish tarts that looks interesting. I think if I blend the medieval and modern recipes, I could end up with something a lot like a salmon & cream cheese bagel. Maybe that'll be my next project. PS Jack seemed to like the pie, but Salem did not. Let's get a few things out of the way. 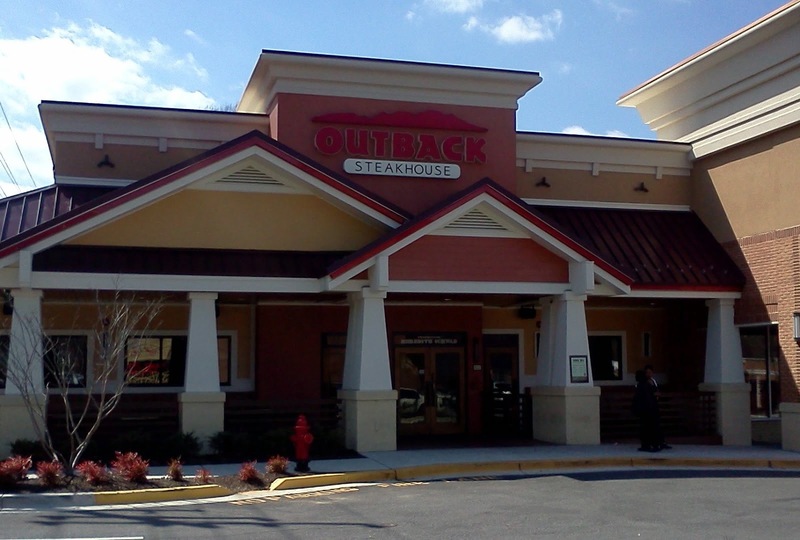 First of all, a couple of years ago, the Bowie Outback moved from one part of Hilltop Plaza to another. As far as I can tell, they did so to be more visible from the road, which is kind of a lame reason. The move helped mess up parking, and left a vacant building at their old location. So jeers to them for that, though I won't downgrade their rating for it. They ended up with some nice decor, though I think they could have done that with a nice renovation. Second, I know it's a chain. I know it's a totally fake version of Australia -- I wish I could eat at Ned Kelly's Retreat instead. Still, Outback is a guilty pleasure, and one of the more promising chain restaurants in Bowie. Since Outback is not open for weekday lunch, one of my usual strategies for planning a Bowie Restaurant Project visit -- taking along a co-worker -- wouldn't work. It's also a bit pricey, so it called for a bit of a special occasion. My birthday did the trick, but the visit kept being postponed due to illness, and once due to a potential 30-minute wait with hungry and impatient toddlers. This time, I called ahead to find out that there was no wait. By the time we got there, a 10-minute wait had developed. That wasn't a huge problem, but we had to repeatedly decline offers of being seated in a booth after we had told them we wanted a table. That mild annoyance may have been indicative of staff turnover, because a couple of times I saw confusion about basic restaurant operation. The food itself, however, was excellent, and the service was attentive. Christina remarked, and I agree, that the food is better than at the Hyattsville location near our old house. I got what I almost always get at Outback -- a steak, medium-rare, with mushrooms on the side. I got one of the larger sizes, intending to save it for a meal the next day -- but I ended up finishing the whole thing. I wasn't the only one who overindulged. Salem, who proclaimed, "That was a good restaurant," as he was being buckled into the car, was up for at least an hour that night with indigestion. I can't blame that on the restaurant, rather a two-and-half year-old who doesn't know when to stop eating. So, three stars. I think if I were planning to eat steak and weren't looking to round out my reviewing, I'd probably opt for the Old Bowie Town Grille or Rip's instead. If, however, I were dining with someone who wanted the familiarity of a chain, or I didn't want to go more than a mile and a half from my house, Outback is a fine choice. When I was younger, I used to read settings for role-playing campaigns that I knew I'd never have time to use. I always sort of wondered why I was doing that. Reading The Long Earth helped me understand -- some writers are far better at setting than they are at other elements -- say dialogue or characterization. The basic idea of the "Long Earth" is fascinating -- an array of alternate Earths, each an easy "step" away once someone discovers the method. The Earths are mostly uninhabited, which raises a series of interesting economic and political questions. The possibilities are explored in interesting ways. The setting is enough to earn the book its three stars. Beyond that, I have a lot of problems with the book. The main two characters in the book (one of them an AI) speak to each other in ways that sound like a 14-year-old nerd's idea of witty banter. E.g., "Although these worlds are full of elephant types. A plethora of pachyderms." There's a third character who arrives later in the book who I like better, which gives me hope for the sequel. I would also like to coin the term "Stark Industries Syndrome" for any sci-fi book where the narrative relies on a corporation run by an eccentric billionaire who seems more interested in science and technology than on making money. (To be clear, I have no problem with Stark Industries itself, thus illustrating a difference in what I think is proper in a comic book versus a novel.) That leads to lines like, "Now when you are dealing with the Black Corporation, funds are essentially without limit." Really? I don't think that's true for Apple, Google, or Exxon -- how much bigger of a corporation is this entity supposed to be. Or, "The ultimate "black box", you might say, is in the belly of the ship, armoured in an alloy that I confidently believe makes adamantium look like putty..." Nothing about this alternative-Earth scenario makes me believe any such thing should be remotely possible, especially developed in secret for a company which doesn't immediately try to monetize the invention. I was initially hoping for something like what I hoped Charles Stross' The Family Trade was going to be before things went off the rails in later sequels. I'm not going to get that, but I'm probably going to read the sequel and hope the setting keeps me from banging my head against my Kindle when I read some of the dialogue. I had initially checked this out because it was on somebody's list of "maybe nominate these novels for the Hugo." I was still reading it when the nomination deadline came around, but did not rush to finish it because I knew I wasn't putting it on my ballot. I hope it doesn't get nominated, but then again I know Pratchett has a lot of fans. I decided that the first Wednesday after Daylight Savings was a good day for my first bike ride to work of the year. On Thursday, I got an e-mail about my activity a year ago (the first Wednesday after Daylight Savings), indicating that it was my first bike ride to work of the year. So I guess it's a tradition! I have had a somewhat sedentary winter, and my goal is to turn it around, in part, by biking to work at least once a week. I understand that a weekly 8-mile round trip will not, in and of itself, burn a ton of calories. But I'm hoping it will inspire me to take the bike out some more -- figure out how to attach the trailer we bought around the time the kids were born, for example. Also, at some point I decided that diet soda wasn't any better for me than regular soda. Unfortunately, I took this to mean, I might as well drink regular soda instead of Pepsi One or whatever. But I have found that when I ride my bike regularly, I don't really want to grab a Big Gulp and undo many of the positives. Before I set out Wednesday morning, I weighed myself -- 217 pounds. I really should be under 200, something that hasn't been true since the 1990s. I figure if I have monthly posts noting how I'm doing on biking to work and on my weight, it'll help keep me to my exercise plan. From June 2006 to August 2009, I tracked my weight on a spreadsheet. Until June 2009, it was almost always above 217, so I guess things haven't gotten worse for me in the past 4 years. Anyway, if I am going to bike to work more, I should try to make good time. Google Maps says it should take me 22 minutes to get there, and 23 minutes on the way home. I did not properly time myself, but I think I was more like 25/30. That should come closer to the ideal times once I'm in better shape. And that's only 10 extra minutes each way over driving, which seems a reasonable compromise. Well, that's it. I'm not cut out to be a Hugo nominator. Given 16 categories (17 if you count the Campbell award, which is not technically a Hugo), I nominated works in only 4 of them -- one work in each. Basically, I don't have the time, energy or cash to read anywhere near a large portion of the sf/fantasy works published in the previous year in order to determine what I think is the best of the year. Instead, however, I look at my input as something akin to voting for an All-Star game in professional sports. Yeah, it's cheesy to fill out the entire ballot with your favorite players, no matter how good they are. But it's OK to make sure that you vote for a couple of candidates who you want to make sure get their due. So I've settled on this approach: make sure to read eligible works by my favorite authors, if possible. Look around for anything else promising, especially if I can it for free on-line, or through my library as an e-book. Then, nominate with a critical eye -- I may really like an author, but if his or her effort is unlikely one of the best five works of the year, I'm not going to put it on the ballot. What I'm really looking forward to is the voting -- first of all, I think of my primary benefit from the process as the selection done by people who are more heavily invested in the genre. Secondly, the Hugo votes traditionally get the nominated works in electronic form, and that's a tremendous value. So in a month I should have the list of works, and maybe a month beyond that, the "voter packet." Oh...which four works did I end up nominating? Jon Grantham, who works in the Melford office park, moved to Bowie so he could be closer to work and appreciates the idea of people wanting to be close to their jobs. Grantham said he sometimes bikes the four miles to work at Melford and that currently, the property is not very pedestrian or bike friendly. “When you get to the end of Belair Drive and you enter Melford Drive it becomes, and there’s no better word for it, scary,” Grantham said, citing a lack of side paths and sidewalks. The development, said Grantham, is currently so automobile focused, he’s concerned it could never be pedestrian friendly. He suggested the city make connecting bike paths and trails connecting Melford to the rest of Bowie mandatory in the development to increase connectivity and pedestrian safety. The connections Grantham mentioned are suggested in the city’s Trails Master Plan, adopted in 2002. I didn't think I actually gave the impression that it could never be pedestrian-friendly, but I guess I do have that skepticism, so maybe it came across. I mean, the closest restaurants by walking distance (other than the on-site cafe) are 2.6 miles away, according to Google Maps. I'm sure the developer would love if residents could only walk to on-site dining options, but the glaring visibility of that fact would probably keep some number of residents away. Anyway, here are my remarks, as prepared. I deviated significantly from them in places, not always to great effect. Greetings, Councilmembers and Mayor Robinson. Thank you for the opportunity to speak to you today. My name is Jon Grantham. I first worked in what is now known as Melford in the summer of 1989, and I have worked there full-time since 1997. I am not speaking on behalf of my employer, rather for myself and for my family. We bought a house in Bowie in large part to be closer to my work so I could spend more time with our twins. I sometimes make the 4-mile commute on my bicycle -- once I even walked it. The first three miles are very pleasant. Levitt really knew how design an attractive community. Where Belair Drive ends and Melford Drive begins, however, it becomes -- there’s no better word for it -- scary. There are no sidewalks or side paths, and bicyclists and pedestrians are forced to merge with traffic which has just exited major highways. I do not understand how St. John Properties proposes to build and market a pedestrian-friendly and environmentally responsible community in a part of Bowie so dependent on automobile traffic, and which is so cut off from the rest of the City. The City’s 2002 Trails Master Plan shows proposed trails connecting Melford to the rest of Bowie. The trail along Melford Drive is the most direct link, but the ones along Crain Highway would connect the proposed community to Whitemarsh Park to the north and retail to the south. I believe that unless the City explicitly makes this connection a requirement of approving a site plan, all the talk of green development will be just a joke. Please only approve these amendments if you intend to make sure this development is compatible with the rest of Bowie and its green principles. That means a development with bike and pedestrian trails that connect to the rest of Bowie.